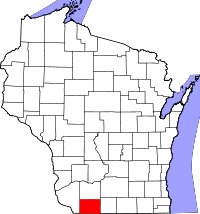 Lafayette County, first settled in 1824, was formed in 1847 from the southern half of Iowa County. Marriage vital records date from formation in 1847, with birth records from 1854 and death records from 1877, but recordkeeping prior to the 1907 state mandate was erratic. Records can be requested locally from the Darlington Register of Deeds, with divorce records from the Clerk of Court. The Wisconsin Historical Society maintains historical records, with a statewide index. The Vital Records Office of the Wisconsin Department of Health in Madison maintains records since October 1907, with uncertified copies public and available for $20 by mail, fax, or in-person request.